The original Wikipedia article for 1 New York Street describes BT tunnels running under 1 New York Street. This plot is adjacent to the Rutherford House location but there is no referenced material showing that these tunnels were connected. The archived project page for 1 New York Street on Buro Happold’s site omits the sentence about BT tunnels. The city centre location of the 1 New York Street site presented a number of challenges as there are adjacent tram lines in the road and tunnels underneath the building. 1 New York Street sits on a site which was previously a BT building with tunnels running from George Street to Piccadilly Gardens. 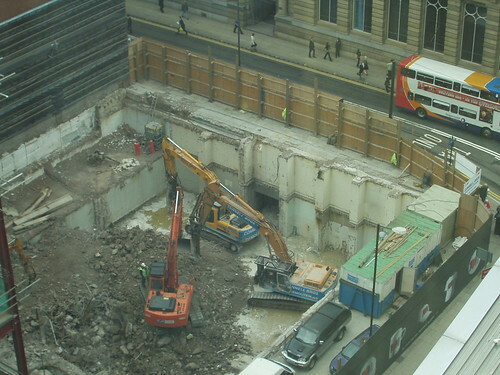 To minimise disturbance to both the tram lines and the surrounding area, the existing basement structure has been used in conjunction with new pile foundations.